You have probably heard me moan that good dairy free chocolate is becoming impossible to find. Supermarket own brand dairy free chocolate tastes cheap and is over priced. I have been browsing online but it’s not an ideal solution hardly a great way to solve a sudden onset of chocolate cravings. In theory dark chocolate is dairy free but this is not always the case. Let me also tell you I have an incredible sweet tooth and cannot tolerate chocolate with more than 60% cocoa. This is why I loved Sweet Williams/Humdinger dairy free white buttons. I say "loved" because the supermarkets stopped stocking them. In the past I have been gifted Booja Booja champagne truffles which are lovely but an expensive indulgence. 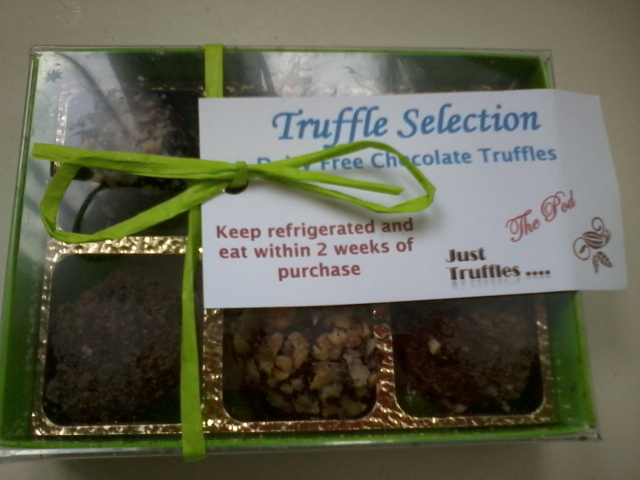 So I’ve been browsing the internet and I came across Just Truffles Hand Made Dairy Free & Vegan Truffles. They also offer regular dairy (milk) chocolates and sugar free chocolates. The dairy free menu is varied with 15 different truffles available. I decided to buy a box of 6 truffles (£4.60 plus postage). 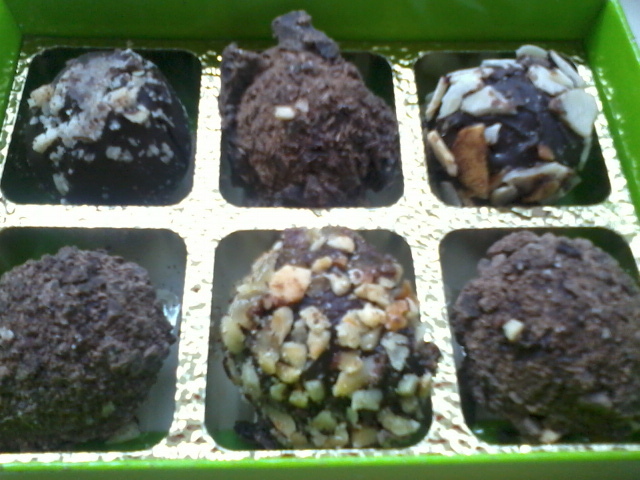 I went for the mainly nuts box which contains 1 of each - brazil nut, marzipan, almond, hazelnut and 2 dark chocolate. Overall the truffles score highly in terms of presentation and quality but a couple let me down on flavour. I enjoyed the almond and hazelnut but the others tasted like alcohol. To be honest I am still a little confused. There are alcoholic flavours on the menu but it doesn't state that the flavours in my box contained alcohol. Everyone’s taste buds are different so I don’t want to discourage you from trying. If you have multiple allergies then I would be cautious about ordering and check with the Company regarding cross contamination. I have no information regarding their dedication to Free From manufacturing processes. No I hate alcoholic chocolate as well, I haven't had a chance to ask the Company why that happened because unless I have been really daft I didn't expect to get them. I think it should be clear on the website. Lovely review, I'm not a fan of alcohol in chocolates, which is odd considering how much I like alcohol & chocolate lol! I am the same separately not a problem but together alcohol and chocolate are not a winner for me. Not sure I want to give Conscious chocolate a try now.